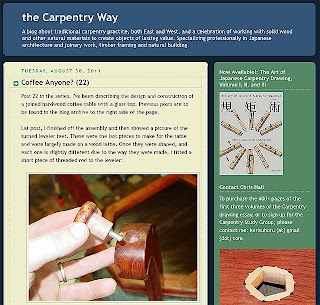 The Carpentry Way by Chris Hall, is a great site to visit for those with an interest in carpentry and joinery, covering the intricacies challenges met in carpentry this the blog also showcases inspirational examples of joinery from around the world. Chris Hall is a professional carpenter specializing in Japanese architecture and joinery as well as working with timber framing buildings. With traditional Japanese carpentry and roof work being his main passion. He is strongly influenced by Ming Period Chinese furniture as can be demonstrated in some of his posts. In his work Chris designs and builds joined structures of many kinds, along with interiors and furniture, and provides carpentry and joinery consultation services, he give talks, and hold classes in woodworking and carpentry drawing. To my mind the blog is extremely well written and filled with useful information. Criss writes with clarity and passion on the subjects of carpentry, carpentry drawing, timber framing and Japanese architecture. This site is well worth a visit!